Bike helmets make sense for racing, mountain biking, aggressive urban commuting, and other kinds of higher-risk cycling. They may also be a good idea for relaxed commuting in cities that currently aren’t safe places to ride due to car-centric street layouts and an epidemic of reckless, distracted, and drunk driving. This includes Chicago and most other large U.S. cities. But in cities that are truly safe for biking, such as Amsterdam and Copenhagen, the bicycle mode share is exponentially higher, and the vast majority of people don’t wear helmets for casual commuting. These places also have far lower bike crash, injury, and fatality rates than their U.S. counterparts. So if lots of people are wearing bike helmets for moderate-paced commuting in your town, that’s probably a symptom of the fact that it’s a dangerous place to ride. If that’s the case, more needs to be done to prevent crashes, rather than just mitigate them. If that’s the situation in your city, feel free to wear a bike helmet for relaxed commuting if you believe it makes you safer. But people shouldn’t waste time exhorting others to wear them. Instead, residents and leaders should focus their efforts on creating bike-friendly street design, mobility education, and traffic enforcement. That’s what will make your city a truly safe place to cycle – with or without a helmet. No, I was wrong. I had mistakenly assumed it was the law for children under 12. I’ve seen the risk compensation research, which is largely applicable/measurable to any safety device’s subconscious impact. The same arguments have obviously been made in football and other sports—wear safety gear, and players hit harder, etc. You can extend risk compensation arguments to literally any safety device/regulation, no matter how prudent/effective, which IMHO makes it something to approach very carefully in cost/benefit analysis. But again, my point is what is the measurable “risk compensation” in cycling? Does it mean cyclists will actually blow red lights or fail to obey traffic rules more often (which is dangerous and could lead to more accidents, and on a purely anecdotal level doesn’t hold true to what I seem to see day-to-day), or does it just mean they’ll ride at 17mph vs. 15 mph (which isn’t dangerous per se, but would still qualify as measurable risk compensation)? Like I said, I’ve seen observable risk compensation in skiing and snowboarding (including in my own behavior), but haven’t seen anything nearly as observable in bicycling. When doing my dissertation (http://www.fietsberaad.nl/library/repository/bestanden/perception%20of%20the%20effectiveness%20of%20cycle%20helmets.pdf) I challenged some of my helmet wearing fellow students to do their usual ride without a helmet, and while they all said that their behaviour would not change and the helmet made no difference to their behaviour, they all reported that they rode more slowly and took more care without the helmet. I’ve seen other reports of people who have done the same experiment with the same results. Not scientifically valid perhaps, but indicative. There have been many calls for the helmet law in Australia and New Zealand to be withdrawn because the effects have been catastrophic, so perhaps it will happen one day. Sure, a shift in routine is going to produce a measurable response. If you’re use to wearing a helmet daily, and you forget it at home, you’re probably going to be impacted by the idea that your perceived safety has diminished and translate that into acting more cautiously. That’s not necessarily the same as saying you ride less cautiously in the long run when wearing a helmet vs. not wearing one, and it ignores the fact that once your routine becomes riding without a helmet your new-found cautiousness may disappear. Have a similar story from a friend who flipped after his wheel caught in a RR track. That was in 1994 and I’m super careful about crossing RR tracks ever since. There is a wealth of research showing that cycling rates plummeted in Australia and New Zealand when they introduced their helmet laws. The number of cyclists dying fell, so the laws were declared a success, but the fall in the number of cyclists was greater than the fall in the number of dead cyclists, so cycling actually became more dangerous. Your personal experience of never having met someone who gave up cycling is anecdote, not data. You’re right about why more people don’t ride a bike, because they fear death or injury, but the reason they do fear those is because the risks of cycling have been greatly exaggerated by those promoting cycle helmets. The actual risks are very low, and are comparable with walking. Regular cyclists live on average two years longer and suffer less from all forms of illness. How can something likely to make you live longer possibly be described as dangerous? Not cycling is more dangerous than cycling. The National Institute for Clinical Excellence and Health said that the best way of improving the health of the nation would be to get more people cycling. But the evidence shows that helmetted cyclists have more collisions. Risk compensation is a subconcious effect, and if it is demonstrated in other areas, it appears inevitable that it would also occur for cycle helmets. The effect does seem to be long term, and if that is demonstrated in other fields, I cannot conceive of why it should not do so for cycle helmets. What makes cycle helmets different to all other “safety” gear that causes risk compensation? Cycling helmets aren’t different than other safety gear, and risk compensation certainly occurs to a degree. I noted as much already. What remains the open question, however, is whether helmet use and the resulting risk compensation makes using a helmet harmful or not worth it. Again, I’m curious as to what type of risk cyclists wearing a helmet are likely to increase/undertake. If it’s riding faster, that in an of itself makes cycling “riskier,” but that not inherently more dangerous/reckless/aggressive. The above is where I see the whole risk compensation argument break down, and that’s true across many sport/activities/safety devices/regulations/take your pick. I mean, if my toddler puts on a helmet, she definitely rides her scooter faster, and she sometimes bangs her head against the wall for fun, but it doesn’t necessarily mean she starts darting out in front of traffic without looking. I think you’re getting too involved in the detail. If all the long term, large scale, reliable evidence shows at best no benefit from mass helmet wearing, and at worst an increase in risk, what does it matter why? The effect, or lack of it, may be due to risk compensation, and it seems likely that this is so, but it may also be due to to other reasons, like increased risk of the most dangerous injuries, rotational. The important thing is that helmets do not reduce risk and the exact mechanism is slightly irrelevant. A friend of mine had a crash like your friend’s and she was not riding fast. FYI – I am not a proponent of helmet laws, because they’ve been proven to be a deterrent to the growth of bike riding. I’m in favor of people making their own informed decisions based on the kinds of riding they do. 1) By increasing the radius of the head by 25% to 50%, helmets make it more likely that the head will be twisted by something which would have been completely missed an unhelmeted head. Moreover, the increased head radius causes a greater torque to be applied, increasing the severity of such rotational injuries. 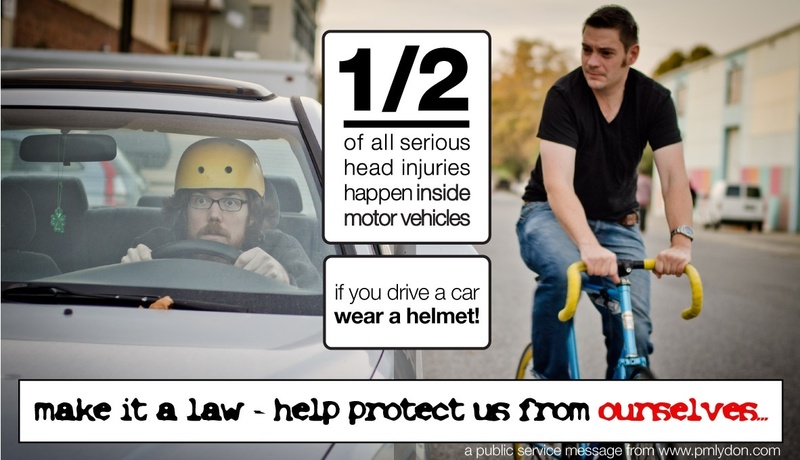 In very oblique impacts a bicycle helmet can convert a minor laceration into a brain injury. 2) Some bicycle helmets can block vision, especially at the periphery. This is especially true for cyclists who ride in an aerodynamic tuck. Vision is the primary sense which cyclists use to avoid potential hazards. 3) Some bicycle helmets can either impede hearing, or change the pitch of certain sounds. Hearing is very important for safe cycling in that it allows you to be aware of potential hazards, such as motor vehicles, from areas other than those which you may be looking at. 4) Helmets may cause cyclists to overheat, and the chin strap may be irritating, uncomfortable, and distracting. Sweat pouring into the eyes may impede visibility. The general level of discomfort will divert attention from the task of safely guiding the bicycle. 5) Increased sun exposure for cyclists who would otherwise wear a cap. 1) Studies have shown that motorists will pass closer to helmeted cyclists than unhelmeted cyclists, increased the probability of a collision which otherwise may not have occurred. 2) Cyclists using helmets may feel safer, and as a result take more risks, which in turn means being involved in accidents they otherwise wouldn’t have been involved in. 3) If helmet use is mandated, the resulting decrease in cycling will cause more injuries and deaths due to lack of exercise than injuries/deaths which would have occurred if a larger number continued to cycle without helmets. 4) Studies have shown that larger numbers of cyclists on the road means greater safety for every cyclist due to greater motorist awareness of cyclists in general. If helmet use is mandated, then cycling will decrease, to the detriment of those who choose to continue cycling. I’ve been riding for 39 years, never wore a helmet, never plan to. For either utility cycling or hard recreational riding, they’re not even remotely helpful or necessary. My primary source of danger riding on streets is motor vehicles. Helmets just won’t help at all in a collision with a motor vehicle. Despite what the article says, I don’t think they’re all that helpful for road racing, either. Speeds in road racing are just too high for a helmet to be effective. The only time I might consider wearing a helmet is mountain biking on off-road trails where a fall is somewhat likely, even for experienced riders, and speeds are typically low enough for a helmet to be effective (i.e. 10 mph or less). I’ve never done this type of riding to date, however. Helmets might be marginally more useful for child cyclists given the lower speeds and great propensity of child cyclists to crash. Even here though few crashes involve head injuries and mandating helmets for child cyclists is more likely to discourage these kids from cycling in the first place. That in turn causes more health issues down the road than helmets would prevent. The best strategy for riding is to avoid crashes given that there are no viable means for a cyclist to protect themselves in most crash scenarios. When you look at bike helmet design, the idea that a helmet might make more sense if you’re racing or riding around the city at high speeds, as opposed to relaxed commuting, breaks down. Bike helmets by design offer little protection at speeds over 8 to 10 mph. If anything, they might actually offer more protection for relaxed commuting incidents than for high-speed riding incidents. However, the risk of an incident in a relaxed commute is low enough to flip the equation in favor of not wearing a helmet in that situation. So basically, outside of mountain biking on trails (i.e. low speeds, much higher likelihood of a fall) there aren’t really any other situations where recommending a helmet makes all that much sense. It’s certainly true risk of an incident is higher when riding in city traffic or racing at higher speeds, but in those situations a helmet offers no protection anyway, so little point in wearing one. And despite the “higher” risk, the actual risk of hitting your head in those scenarios is still lower than when you’re walking. Well under 1000 cyclists die on US roads each year. Nearly all of these deaths involve a motor vehicle. A bicycle helmet is close to useless in a bike-motor vehicle collision, and yet such collisions are often given as one reason why helmets should be worn. We might be better off dropping the helmet advocacy completely and focusing on better bike infrastructure. This two-pronged approach would stop falsely giving the people the idea that cycling is dangerous, and the better bike infrastructure would produce far better results in terms of lives saved. The best way to save cyclist’s lives is to prevent them from getting in collisions with motor vehicles, not getting them to wear helmets. So even if a helmeted cyclist takes no risk compensation, this doesn’t mean other road users do the same. Also, while talking about benefit versus reward, the hard fact is the number of deaths helmets might prevent annually in the US is at best in the low double digits, most likely in the single digits. TBI while cycling just isn’t all that common. It’s sort of like advocating that we wear suits to protect against lightning strike. That might save lives, but the number saved would be so small as to make the benefits negligible relative to the downsides. We have bigger fish to fry, starting with separating motor vehicles from bikes as much as possible. That has a much bigger bang for the buck in terms of saving lives than advocating for helmet use. You shoot down well leveled and grounded argumentation with ‘that’s study’s not new enough – bad study – show me the data’ but support your own with “I’ve never run into a person who… Most people don’t . . . but I doubt, etc., etc…” A bit of a double standard. The fact of the matter is that modal share of cyclists go down when helmet laws are implemented. If you see zero injury as the ultimate goal, this is a win-win. If you see more people using bikes as the ultimate goal, this is a lose-lose. I ride where I live and use bike share in many of the metro where I do business: London, NYC, Vienna, Paris… If I was forced to wear a helmet, I wouldn’t use them. Cities with helmet laws have failed bike share and low modal bike use (Seattle, Melbourne, Sydney). Again, if you prioritize not having cyclist being injured, this is great as there are no cyclists to tally injuries, if you wish to have an active commuting population, it is a disaster. Those are the facts. While I generally agree with your sentiment allow me to share an exception I hold: Riding drunk. Don’t laugh. I have a family member who drinks a lot, and is the chancellor of a university in England which involves a lot of socializing and being mobile. His solution is taking the bike which allows his mobility while not endangering other road users or his criminal record. He crashes once in a while and when drunk, the reflex to protect the head is diminished. In this case, the helmet is a very good idea. Yes, Motorists on a jury will be told that anyone who rides a bike without a helmet is a danger to themselves and others with their self destructive behavior. Emergency evasive maneuvers to avoid all of these crazed bicyclists throwing themselves at our windshields is dangerous for motorists too. The jury will sooner buy this than to come to an understanding that bicycling with an education in safety is not dangerous. We have long lost the stigma contest. OK, yes, I agree that a jury full of people who only drive would easily buy into an argument that is crafted like that. That’s an unfortunate reality and will likely stay that way for a long time. Well, run into one. I never have worn, and never will wear a helmet. And I’d prefer my fellow riders not wear one. Millions of people around the world are cycling without one. We Don’t have lots of cycling injuries, and most of the ones we do are due to careless vehicles. Cyling is safe and wearing a helmet is unnecessary, counterproductive and makes would-be cyclists fearful. And the problem is…you’re riding too fast. If, after braking (you did, didn’t you?) you still were at 15, that’s insane. Except in controlled conditions, riding at any speed more that 15 is asking for trouble. Aren’t you being just a bit judgmental without knowing very much about the circumstances leading up to the crash or the nature of the ride? Please give other people the benefit of the doubt unless you are fully informed about the situation. Thank you. Bicycle helmet use requires a belief that riding in traffic is dangerous. No, because I’ve been riding for 40 years at slow speeds and can’t even imagine a “chain reaction crash.” You’re going too fast for the unforeseen conditions. And, as an also avid driver, I can easily imagine one at the higher speeds I love to drive at. Bottom line: cycle slow and you’re safe. If we rush to judge other people or make blanket statements about all types of riders, we miss the basic point of what John is saying here. Whether you are riding short or long distances, going at a slow, medium or fast pace, riding a mountain bike, fixie, road bike, city bike, etc., for whatever reason you’re riding on a given day, make the choice that makes sense for you for that trip. We all have different levels of bike handling skill and experience. There is no “one size fits all” solution. On any given day, I’d rather see each of us get where we’re going with a minimum of stress and without any injuries or bike damage. Peace. There is such a thing as riding too fast for the conditions. However, blanket statements like “riding at any speed more than 15 is asking for trouble” don’t mesh with reality. I find speeds up to about 25 mph are comfortable and safe for most types of riding. Obviously there are circumstances where you need to slow down. And there are times it’s safe and reasonable to go well over 25 mph, like a descent on a road with good visibility. The only time I might say a speed is “unsafe”, even if road conditions allow for it, is when you’re exceeding the design speed of the bike. Even clunker bikes are safe at 25 mph unless they’re poorly maintained. A good road bike is designed for speeds of 40+ mph. Some velomobiles are designed for sustained cruising at 50+ mph. The primary concern at higher speeds might be blowouts but airless tires like I use negate that issue entirely. All that said, I’ll readily admit there aren’t many places where it’s safe or reasonable to go much above 30 to 35 mph in a place like NYC. The poor street conditions are often the main thing which forces me to limit me speeds to 30 mph or less, often far less. I hope your accident-prone family member uses more safety equipment than just a helmet. A group ride is a higher risk activity than commuting around town. Safe riding is about risk mitigation/risk avoidance, which is why I avoid commuting on streets with high levels of bike traffic (like Milwaukee). So I can never have a ‘chain reaction’ crash. One time I had to avoid 2 cars in quick succession and rode into a crack, which seized the tire and stopped my bike, sending me flying facefirst off my bike. I was only going about 8 mph at the time, so I was able to put my hands out and break my fall. I got a sore left wrist and a sprained right arm, but no broken nose or facial injuries. Then I logically resolved to reduce my risk and got rid of the thin-tired road bike, replacing it with a wider-tired hybrid. If you don’t reduce your risk and engage in high risk activities, expect more problems. Oh I embrace it! Personally, the vast majority of my miles are training and I do wear a helmet then. I’m talking about your average commuter or someone just getting around town not participating in the sport of cycling. My rule of thumb is the helmet always comes out when the kit comes out. When I’m casual it really depends on the weather and where I’m going. I’m not anti helmet I’m just anti helmet shaming. So people are not supposed to wear helmets as some kind of statement about how a space is preferably bike friendly? When riding, I’ll continue to wear a helmet and protect myself against anything that might happen. Are Helmets Still Necessary for Bike Commuting in Chicago?